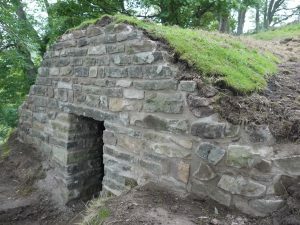 During late Summer 2015, repairs were carried out to the small, semi-subterranean building sited just outside of the main settlement – a place for storing root vegetables. The stone built chamber has a stone vaulted roof and was built into the hillside. One corner of the building moved over time and recently caused part of the roof to collapse. Repairs were carried out to stop further decay of the building with funding from Yorkshire Water. Although only a small part of the village, tucked away on the hillside, this building is an important part of the story of life in this remote part of Upper Nidderdale. For two weeks in July 2016 a team of volunteers, led by Solstice Heritage, sought to unravel the story of the abandoned village of Lodge as part of a community archaeology excavation. The team was led by Jim Brightman of Solstice Heritage who was assisted by freelance archaeologist Spencer Carter (TimeVista Archaeology). Some 40 volunteers, generally from the local community and including students from University of Bradford, took part in the excavations. Find out more about the excavations here: Big Dig 2016. The Landscape Partnership is grateful for additional support from Yorkshire Water, Harrogate Borough Council, and local farmer Martyn Brown.